How can we detect and understand oncoming crises in time to avert them? Sometimes we must “zoom out”: expand our perspective and find similar situations in the distant past. A good example is climate change. What can a few degrees of warming do? To answer this, we need to know some history: how the Earth’s climate has changed over the last 65 million years. John Baez, Zooming Out in Time, one of the Seminars About Long-Term Thinking at the Long Now Foundation. Doors open at 7 pm at The Cowell Theater, San Francisco, Friday October 13, 02006. The Long Now Foundation was established in 01996 to develop the Clock and Library projects, as well as to become the seed of a very long term cultural institution. They hope to provide counterpoint to today’s “faster/cheaper” mind set and promote “slower/better” thinking. They hope to creatively foster responsibility in the framework of the next 10,000 years. 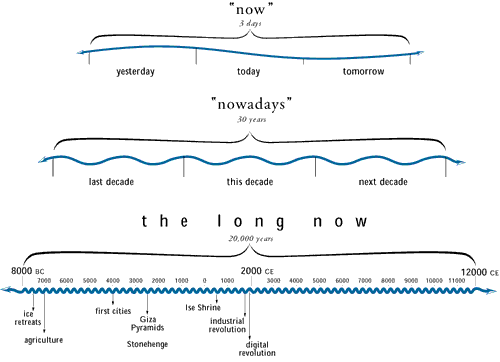 The Long Now Foundation runs a series of talks called Seminars About Long-Term Thinking. The version without hyperlinks is a bit prettier. The version with hyperlinks takes you to more information about each picture. What will come first? A good understanding of n-categories, or ecological disaster unravelling the world’s economy, thereby removing support for research in mathematics. Better prepare the mathematical seed bank. What will come first? I’m not sure, so I’m playing both angles: trying to hasten research on n-categories and slow down ecological disaster. I actually think there’s more to life than n-categories, or even math. And I’m more worried about loss of species than loss of mathematical concepts, since I know lots of species are going extinct, and their genes took much longer to arise than any one mathematical concept did. Better prepare the mathematical seed bank. Better prepare the Frozen Ark! John Baez, Diary: October 7, 2006. He mentions positive and negative feedback mechanisms. Another negative feedback is this: When there is more CO2, trees can grow in drier areas because they don’t have to keep their pores open as much to get a given amount of CO2. So they lose less moisture. There has to be some feedback that has kept the CO2 level very steady before the recent rise, and this is a likely candidate. One big question is whether or not we’ve pushed the climate so far from equilibrium that it can’t roll back to where it was whatever we do. Zoom out further still to the last 65 million years. The temperature graph show several major features. One is the rapid (every 100,000 years) wide swings of major ice ages. When they began, 1.35 million years ago, is when humans mastered fire. But almost all of the period was much warmer than now, with ferns growing in Antarctica. “Now it’s cold. What’s wrong with a little warming?” Baez asked. The problem is that the current warming is happening too fast. Studies of 1,500 species in Europe show that their ranges are moving north at 6 kilometers a decade, but the climate zones are moving north at 40 kilometers a decade, faster than they can keep up. The global temperature is now the hottest it’s been in 120,000 years. One degree Celsius more and it will be the hottest since 1.35 million years ago, before the ice ages. Baez suggested that the Anthropocene may be characterized mainly by species such as cockroaches and raccoons who accommodate well to humans. Coyotes are now turning up in Manhattan and Los Angeles. There are expectations that we could lose one-third of all species by mid-century, from climate change and other human causes. Okay, to think about major extinctions, zoom out again. Over the last 550 million years there have been over a dozen mass extinctions, the worst being the Permian-Triassic extinction 250 million years ago, when over half of all life disappeared. The cause is still uncertain, but one candidate is the methane clathrates (“methane ice”) on the ocean floor. Since methane is a far worse greenhouse gas than carbon dioxide, massive “burps” of the gas could have led to sudden drastic global heating and thus the huge die-off of species. Naturally the methane clathrates are being studied as an industrial fuel for when the oil runs out in this century, “which could make our effect on global warming 10,000 times worse,” Baez noted. A mass extinction is a sad thing, but life does bounce back, and it gets more interesting each time. From what I’ve read of Stephen Jay Gould, I take it he might have taken issue with you on this. Perhaps it depends on what you mean by ‘interesting’. Do you have ideas on why life becomes more interesting after a catastrophe? Wouldn’t any such account have to have a teleological flavour? From what I’ve read of Stephen Jay Gould, I take it he might have taken issue with you on this. Yeah, I’ve read all his books. His position on this is skilfully argued but controversial. I wouldn’t want to to debate him, especially since this business about “life evolving to become more interesting after a mass extinction” is not the main point I’m trying to make. Perhaps it depends on what you mean by ‘interesting’. I think life with single-celled and multicellular organisms is more interesting than life with just single-celled organisms. A lot of development of multicellular organisms seems to have happened during the Cryogenian Period, when the Earth was almost completely frozen due to runaway climate feedback. I think life with lots of animals on the land and in the sea is more interesting than life without many animals on land. The colonization of the land in the Late Devonian may be related to the massive ocean extinctions in that period. But, the cause of these extinctions is a big mystery, so it’s hard to tell. I think life with lots of mammals and birds is more interesting than life dominated by reptiles - especially since mammals show more emotions than reptiles. The rise of these warm-blooded animals seems related to the extinction of the dinosaurs when an asteroid hit Chicxulub at the end of the Cretaceous, and the subsequent (probably unrelated) global cooling which caused a major extinction at the end of the Eocene. I could go on, but it’s all a bit fuzzy - more of an idea than a firmly held view. Do you have ideas on why life becomes more interesting after a catastrophe? Wouldn’t any such account have to have a teleological flavour? No! It’s pretty easy to imagine that highly stressful situations will encourage life to adapt in ways that permit it to survive in such situations. This could make life more “interesting”, as a kind of side-effect. It’s interesting to look at this chart and note the yellow line showing the time-averaged extinction rate for marine genera over the last 542 million years. It’s gradually dropping, which may mean that life is evolving to become more “fit” in some sense. This might be related to it being more “interesting”. So is this a story of escaping local maxima? In the long intervals between catastrophes, organisms other than the dominant ones can evolve, which in some sense have a more sophisticated capacity to interact with the physical environment, but do not have the opportunity to dominate. If they can survive a catastrophe which knocks out their rivals, perhaps by means of this capacity, they then have a chance to flourish. But presumably there’s nothing to stop a good catastrophe taking out everything as sophisticated as the dominant species. Too vigorous a piece of annealing. Is it known how the mammalian ancestors fared through the asteroid impact 65 million years ago? So is this a story of escaping local maxima? Could be! Sounds good to me. But shockingly little is known about these mass extinctions - what caused them, precisely when different species died, and so on. For example, there are smart people who don’t believe the asteroid impact at Chicxulub caused the KT (Cretaceous-Tertiary) extinction. For one thing, there are 4 other big craters from around the same time. But one might say that just confirms the asteroid impact theory. More importantly, some people blame massive lava flows - a million cubic kilometers of flood basalt in India, in a formation called the Deccan traps. These lava flows might have been caused by impacts… and indeed people have recently found an impact crater in the sea floor of India… but the Deccan traps might have begun their work before the impacts: it’s hard to tell. Anyway, it’s pretty widely agreed that the diversity of dinosaur species started dropping 10 million years before the impact. Sea levels dropped earlier, too. All the earlier extinction events are shrouded in even more mystery. So, high-level theories like the one you just proposed are tough to study in a really detailed way. Too vigorous a piece of annealing. I should let people know you’re talking about simulated annealing, a “probabilistic meta-algorithm for the global optimization problem, namely locating a good approximation to the global optimum of a given function in a large search space”. To keep the search from getting stuck at a local optimum - a little hill instead of a mountaintop - you have whack it occaisionally. Perhaps with an asteroid. Is it known how the mammalian ancestors fared through the asteroid impact 65 million years ago? Birds were the sole survivors among Dinosauria, but they also suffered heavy losses. A number of diverse groups became extinct, including Enantiornithes and Hesperornithiformes. The last of the pterosaurs also vanished; mammals suffered as well, with marsupials and multituberculates experiencing heavy losses; placentals were less affected. Mammals of the Late Cretaceous were not herbivores. Many mammals fed on insects, larvae, worms, snails etc., which in turn fed on dead plant matter. During the crisis when green plants disappeared, mammals may have survived because they lived in “detritus-based” food chains. Soon after the K-T extinction the mammals radiated into plant-eating lifestyles and were soon followed by other mammals that became carnivores. … the lesson I took from your talk was the under-appreciated title – Zooming. The ability and need to think in MULTIPLE time scales and zoom between them is what is so often missing. Now that I’ve seen climate in zoom mode, I want to see biology in zoom mode, architecture in zoom mode, technology in zoom mode, and so on. Excerpt: Slides from an easy talk on the open problems in fundamental physics.